Today I made a short trek to find Mara des Bois Strawberries at Chino Farms, the exclusive little farm stand made famous by Alice Waters. As always, the produce was stunning, the staff ridiculously snotty, and the prices exorbitant. They had peaches and nectarines but couldn’t be bothered to tell me anything more about them than that they were “white”. Clearly they did not realize I was the Fruit Maven and owe my readers a little more than a grocery store description. Would they dare describe an apple as simply “red”? I think not. I need a t-shirt that says “Farmers are Frustrating”. So I passed those up and moved on to the gorgeous trays of strawberries. Here they had a little more to offer and knew that the nickel size, long stemmed beauties were the delightful Mara des Bois. The woman could barely pronounce it and had no idea how to spell it, but being the detective that I am, I took her mumbling and turned it in to gold — pure wild, french, gold. Ok, ok. That may be an overstatement regarding my contribution to the creation of these starlets, but they are amazing and if you give me even one bit of credit for introducing them to you, then I will feel I have made a small contribution in this great world after all. This is what all strawberries should taste like. This makes the grocery store strawberry taste like cardboard and the farmer’s market strawberry seem like an overpriced juice box with a stem. This is a complicated, sophisticated little starlet. You should run to find these and pay whatever the cost. Thank you, fruitmaven! I’ve missed you! Wow! A 5-star fruit. Is this a first? It may seem anticlimactic but I’m actually here to ask about the strawberry tree, whose fruit probably looks or tastes nothing like this. It’s a common landscaping/median tree in northern California. The prickly small fruit is mushy. But I like free food! You know — it might be a first for all 5 stars. I can’t think of another. I thought maybe the Green Dragon Apple, which is an apple I just love love but nope. I don’t know anything about the strawberry tree. Must investigate! 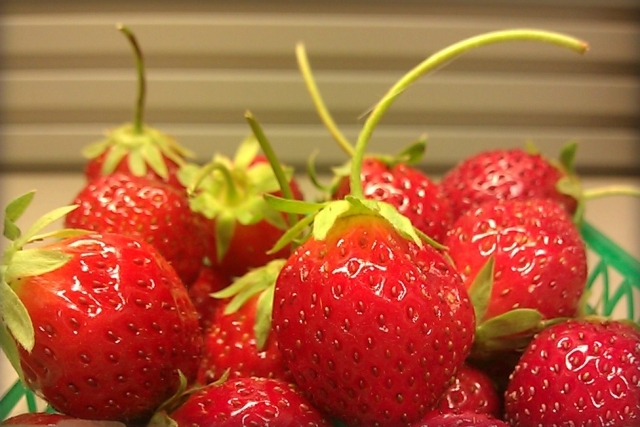 Hi Fruit Maven, thanks for your ratings on these Mara des Bois strawberries. I bought a whole bunch of MDR roots from hirts earlier this year, and then doubled down with another bunch from burpee. I hope they come out tastey and aromatic and heavenly as you’ve described. Where I came from, there were strawberries that I could smell 10 yards away cuz they so damn perfumey. But here in ‘merica, the market strawberries are a complete joke. I DON’T GET IT! Why are they selling large gigantic strawberry fruits that have so little flavor? By the way, you happen to try any of those Purple Wonder strawberries?